Building on the legacy of Greenbrier Learning Center, out-of-school time programs for students at-risk of falling into the achievement gap. Each summer, Aspire! offers a six-week, full-day intensive summer camp to prevent summer learning loss among our students and bolster their reading. Summer camp themes are set in January of each year and reinforce academic content, including concepts from the Virginia Standards of Learning. Learning ROCKS! Summer Camp provides 212.5 hours of enrichment and academic support over six weeks, resulting in 6,375 hours of direct service and support to South Arlington children during the summer. Established in Summer 2010, Aspire! Afterschool's Middle School Buddies program eases students' transitions from elementary to middle school and develops youth leadership skills. This project is innovative in its approach, utilizing the talents and skills of existing middle school students to serve as “peer mentors” to younger students, building respectful and supportive relationships and generally maximizing students’ opportunities for success in middle school. 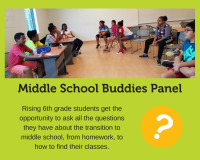 The Middle School Buddies program aims to promote youth leadership and to serve as a resource to youth in the Arlington Community. We foster the development of positive role models who develop strong relationships with younger students and perform service that benefits their community.